If you're looking for the best in RV sales and service, you've come to the right place! We offer a wide range of both new and used travel trailers, fifth wheels and motor homes, as well as skilled technicians for all your service needs. Our experience in the RV business allows us to partner with you, the newest member of "our family", to find you the perfect RV or to service your current one! 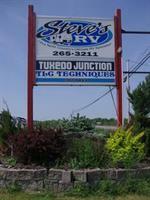 Let us make your RV shopping experience fun and relaxing and we promise you'll leave here a HAPPY CAMPER! Located just outside of Potsdam, between Potsdam and Canton, on Route 11.